Here is another generica who I think deserves her own topic. After much effort she was finally identified thanks to her credited role in the fotoromanzo Moulin Rouge N. 41: "Dal collegio al carcere" from 1963. Valeria dentro e fuori (uncredited) .... role? Could the woman in the circle be our elegant generica? 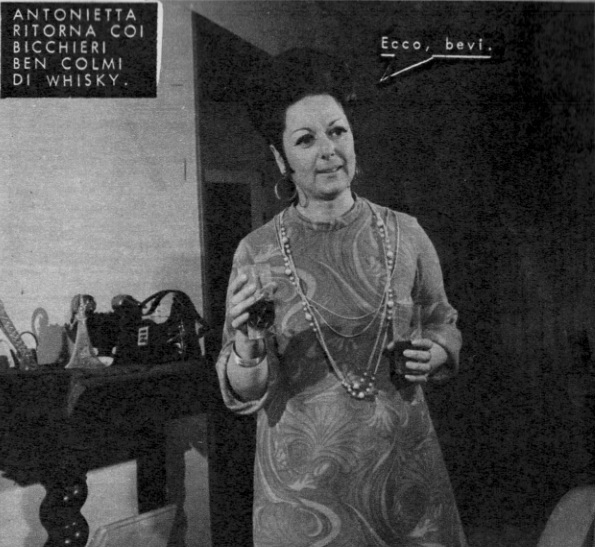 This is from a 1965 Carosello sketch, and she's waiting in line at the cinema with Sideburns-man. Our generica appears to be playing some kind of teacher, and the cast list credits a certain MILENA ZAMPANA with the role of 'maestra'. This description does not fit anyone else in the story, so my conclusion is that our generica is indeed named Milena Zampana. So there! Another one identified!! Major discovery,my compliments johan,i do love fotoromanzi every day more lol ! TRS,October 24, 2014 03:35 pm wrote: Congratulation too for this identification! 3 (or more) at one day? Incredible! Johan Melle,October 24, 2014 03:35 pm wrote: I know exactly what you mean! For a very long time there were no new identifications made from the fotoromanzi, so I began to give up! And then in a very short time period I suddenly found the name of not one, not two but THREE generici! I still cannot really believe all this luck! I have also found Milena in another fotoromanzo. Moulin Rouge N. 80: "Incontrarti e perderti" (15 June 1965). Here she plays a very big and substantial role, yet this time she is not credited! But the whole thing turns out to be a set-up. The ambulance personnel are robbers and Milena is actually their accomplice! The robbers then finally hide the guns and the stolen jewelry together with Milena under the blanket and carry her out to the ambulance. Not a very big role for Milena but certainly a very memorable one!